FINAL SALE. 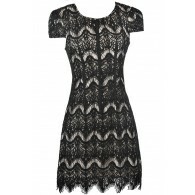 The stylish print of this little dress is the perfect way to update your wardrobe. The Double Vision Chevron Print Dress is fully lined except for the sleeves which are semi-sheer. It features a vertical chevron striped pattern in shades of black, white, and grey throughout. The rounded neckline, three quarter sleeves, and classic fitted cut create a flattering silhouette that can be accessorized many ways. A low dip in the back of this dress adds a flirty touch that will get you noticed as you walk away. The Double Vision Chevron Print Dress would look great paired with black or grey pumps and some pretty jewelry for a night out with friends. Details: Lined except at sleeves. 65% cotton, 35% polyester. Lining: 100% polyester. Hand wash cold water separately. Color will bleed. No bleach. Hang to dry. Small measurements: Length from top of shoulder to hemline: 34”. Bust: 32”. You have added Double Vision Chevron Print Dress into Wishlist. 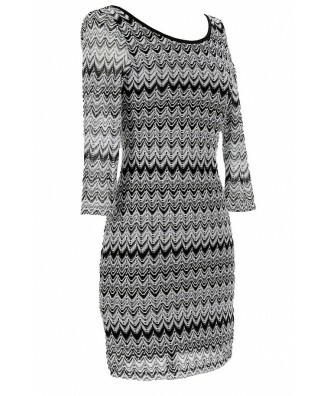 You have added Double Vision Chevron Print Dress for Stock Notification. You have set Double Vision Chevron Print Dress as a loved product. You have removed Double Vision Chevron Print Dress as a loved product.